Are you into mobile gaming? Then you might have heard of OnLive – the cloud-based service that allows you to play high-quality video games on a smartphone or a tablet. What makes this service special is that all the computing is offloaded to OnLive's servers, while a video of the action is being streamed straight to your mobile device. The list of games available on OnLive includes Homefront, Civilization V, Assasin’s Creed Revelations, Dirt 3, and more. And keep in mind that these are not mere Android ports, rather the full-fledged versions of the games. 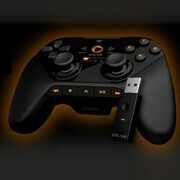 Is anyone tempted to get an OnLive controller for their smartphone or tablet? Let us know by dropping a comment below. how bout streaming games from an XBOX to your tablet playable with the xbox controller, make such a device and see the money pouring in!!! Why buy one? I've been able to connect my PS3 controller to my androids via Sixaxis Contoller app for quite sometime. The OnLive site is good to learn more about though. Using androids as a game console is going to be the wave.